When you have agreed a price for your rent/service charge that’s all you pay. There are no hidden costs for parking, each set of keys, etc. You can purchase extra services such as removal services to help you move in but they are all completely optional. Unlike many other office space providers who charge £30 (or in some cases as much as £70) per employee per month for parking, at the Adelphi Mill parking is completely free of charge for you and all your staff. That’s a saving of £2,160 per year, if your office was occupied by you plus 5 staff . Reserved parking available by arrangement. 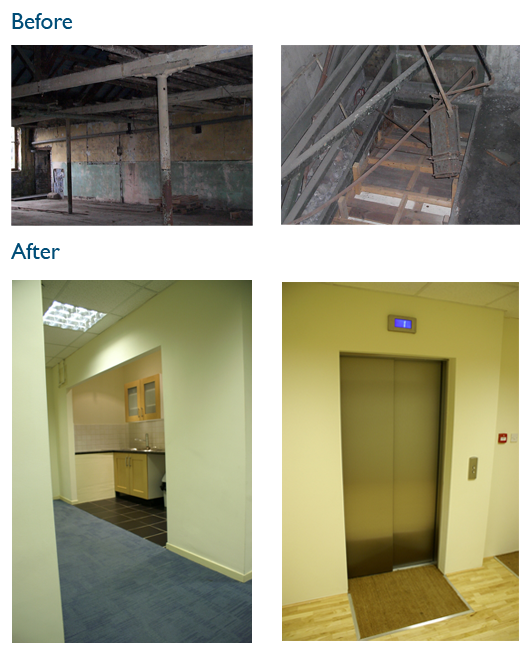 Here are some pictures of before and after the refurbishment work. Cafe/Restaurant on the 1st floor, open weekdays for breakfast and snacks, lunches, refreshments and catering for meetings etc. 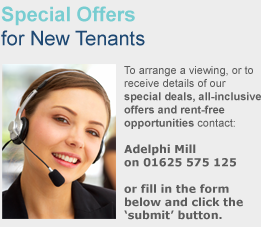 Fully equipped gym with preferential membership rates offered to Adelphi Mill tenants, also pay-as-you-go prices. 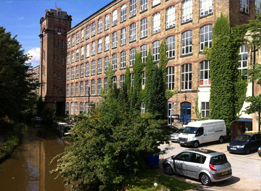 The Adelphi Mill is an award-winning Grade II listed former cotton mill which sits along side Macclesfield Canal on the edge of the Peak District. The Mill was constructed by Martin Swindells, a local cotton spinner who also owned Clarence Mill. The Adephi Mill was build for Swindells’ two sons – hence the name ‘Adelphi’ which is Greek for brothers.